Our soaps are handcrafted in small batches from our 1830's farmhouse using the finest natural ingredients. Each bar is a work of art, beautifully packaged with nostalgia in mind. You'll find something for the whole family, including your pets! Varieties may change with the seasons. If you don't see a soap you are looking for email us as we may have it. Unless otherwise state, all handcut bars are an average weight of 4 ounces. 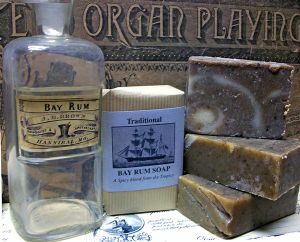 Our Bay Rum soap has been a consistent best-seller since I introduced it years ago. Redolent of spice, bay and citrus, this is definitely not your Grandpop's bay rum, it has a richer, spicey scent that even women love! Essential oils and finely ground spices leave skin fresh, moisturized and gently exfoliated. 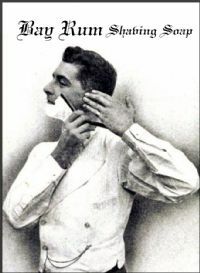 Makes a great shaving soap too...just ask my husband! Packaged with a vintage image of a circa 1850 Boston schooner. Also available in our Silent Soaps line as "Buster's Bay Rum"
Fresh and invigorating Ginger Oatmeal soap is a new scent for spring that is becoming a best seller. Essential oil of Ginger and colloidal oatmeal, along with Scottish oats are incorporated into the base for a truly different bath experience. Moisturizes and refreshes! Did you know that farm fresh, grass fed tallow and lard are now considered 2 of the healthiest fats you can consume? They're also good for your skin, and this is one super long lasting chunk of good old fashioned soap like Granny made, only much better! Prepared in small batches using the cold batch process. Gentle on your skin but tough on grease, dirt and grime. You will not find it to be harsh like Granny made in the old kettle out back, my soap is much more refined due to careful measuring of fats and lye so nothing caustic is left in the soap. Long curing time ensures gentleness. Use it for laundry, scrubbing floors, bathing pets, cleaning dishes and general all purpose cleaning if you choose, as well as bathing for its creamy mild lather and skin moisturizing properties. This is THE perfect soap for "survivalists" who want a good wholesome soap they can bathe with and use for other cleaning purposes.